It's around this time of year when, thanks to the heat, we all dream of frigid December nights. Yes, there's still plenty of hot times ahead—especially with this latest crop of European software. So position one fan at your head—and another at your ST—and let's get on with it. But first a correction. I noted two new programs from Psygnosis in the last issue, Super Menace (tentative title) and Blood Money. Well, I goofed. Blood Money is the name for what I called Super Menace—the other one being nameless at the time. Just goes to show what happens to brain cells when you stare at monitor screens too long! Now that that's out of the way, I have some good news and some bad news. The bad news is that all of Earth's populace is dead, the planet a barren shell after colliding with a massive asteroid. The good news? You're now the big boss. Not exactly a birthday card for the commander of Moonbase, which now holds the last remnants of humanity. Set in the year 2200, Millennium 2.2 requires a lot of concentration and consideration. The stakes are huge, because it's now your task to repopulate the solar system with humans. This means a lot of hard choices and hard work. Technology must be created so that the spacecraft can be launched for colonization. People to fill the craft must be genetically manufactured. And then there're the "everyday" problems of coping with the Moon's hostile environment. An icon bar at the top activates the various areas of interest and need, from computers to the research labs and mining facilities. Great detail has been applied to this game, from the atmospheric graphics to the galactic map that moves the way stars really do. Additionally, there's a wealth of accurately researched data to gather and explore in your quest to restore humanity to the universe. A lot of games are created from other ones; think about how many Defenders and Pac-Mans you've seen in different clothes. So here's a refreshing, if a bit odd, change from the usual: Populous from Electronic Arts U.K.
You finally made it to the top; you get to play God. Commanding one warlike nation is your chore, while the evil one schemes to overcome and destroy the guys that look to you for guidance. Expect to spend some time expanding your people's territories and helping populate them with the good guys. Give them a nudge at creating new technologies so that the other nation can be wiped off the face of the planet. The first step is to clear some land so that cities can be built. Technology increases as the cities grow, and your divine power rises in proportion to the number of people and the level of their sophistication. Plan on creating knights to fight and destroy the enemy, while also harnessing the forces of nature. (Unfortunately, there are some giant birds and sea serpents that randomly show up to shake things about.) Digitized sound effects enhance such "natural" disasters as earthquakes, floods and volcanoes. There are two modes of play. 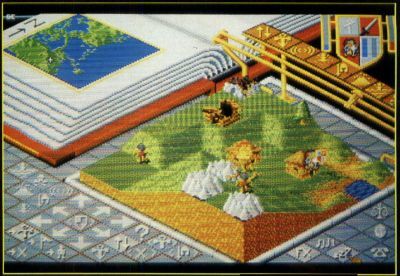 "Conquest" features multitudes of worlds based on varying terrains, the arctic being one, while "Custom" lets you pick the specifications for the world. There's a 3D map of the current world, which can be zoomed in on for minute investigation. The graphics are nifty and colorful. 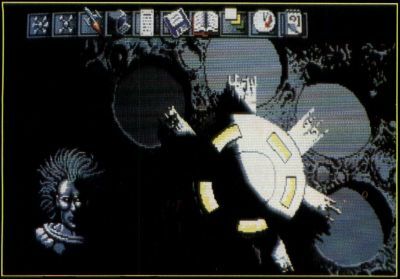 Play against the computer or connect via modem to another ST or an Amiga. Also from EA is Fusion (created by Bullfrog Productions). 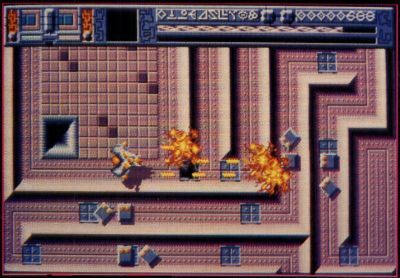 The mission sounds simple: Just collect nine pieces of a bomb that's been scattered over 14 alien levels and return them to the first level. Of course, there are a few difficulties. First you have to pilot an Assault crawler in search of the Mother Ship (faster and with more firepower). Thank goodness there's joystick control; trying to maneuver around with a mouse would be insane here. Then expect to be baffled by a number of puzzles; you have to do some thinking here. Icons scattered around the alien landscape are helpful because they add weapons and reenergize shields. The sound effects are digitized and are quite good overall. Unfortunately, the opening music (also digitized) just doesn't make it with the ST, being full of distortion and noise. A tip: Don't keep waiting for the program to load just because you see the drive light on. Most European programs keep the drive "lit" even when it's not running, so once you tire of the tune, hit the spacebar to start up the game. An on-screen information panel indicates the ship's structural integrity, shield level, active switches and bomb display units. A combination of arcade and strategy, Fusion is plenty of fun, what with the eight-direction scrolling and the digitized sound effects (including the use of a professional drum machine). Graphics are nicely detailed; nothing looks chintzy here. 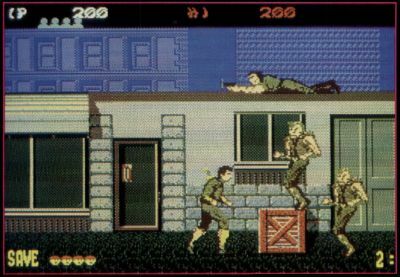 Next up is Virgin Mastertronic's arcade transfer of Shinobi—Master Ninja. So new in fact, there's only a demo to look at right now. The Ring of Five, evil terrorists all, have kidnapped children of the world's leaders. The kids are held prisoner in different locations and guarded by vicious karate thugs. Your mission is to find and rescue these children. So it's time to tape up your fingers and grab the old joystick. You are well prepared, being a master at stealth and the martial arts, your body as lethal a weapon as any of those you carry, including sword, shuriken and nunchaku. Each level will pit you against henchmen and a member of the evil ring—plus many surprises as you battle through five missions (19 levels). Graphics on the demo look good (there's that big helicopter waiting to pulverize or be pulverized), and karate fans will find this game worth sinking their shurikens into. Aaar, mateys, it's a cosmic pirate's life for me. But things aren't as simple as they were in the days of Bluebeard. First you have to prove yourself worthy of the skull and crossbones, and that means working your way up the ranks. 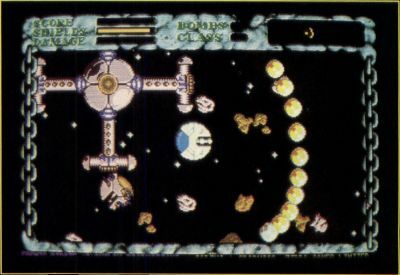 Cosmic Pirate (Palace Software) requires you to practice through a number of vector-graphic scenarios in order to learn the ins and outs of your craft. Points are awarded, which can be used towards purchasing a spaceship for use in a real mission. Then it's out into the galaxy in search of plunder and one of those fat Spacetrucks. Plunder can be acquired by blasting. Follow the hyperspace beacon and check out the sector map. Then head for a new planet and see what you can find. Of course, you have to keep out any competition (i.e. blow up other pirates), and any aliens you might meet in space should be neutralized (i.e. again, blast them to smithereens). There are far too many of these dorks, and they've a few bad surprises, like intelligent homing missiles. Your ship comes equipped with guns and power shields; customizing it is a priority and can be done, once you've made a few bucks, after you've returned to base. 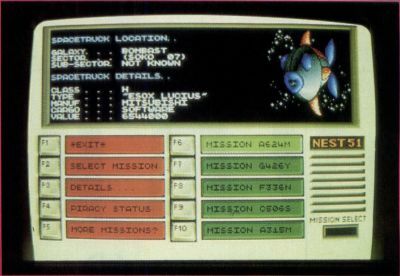 All action is controlled by joystick, with menu features activated by the function keys. There's a snappy tune to listen to, and visual effects are neat (watching your ship blow up is actually fun). You've always wanted to be the bad guy, right? Well, now's your chance! Next time we'll see what's cooking over at U.S. Gold in Britain. This is one company putting out a lot of stuff for the ST. Marshal M. Rosenthal is a New York-based photographer and writer specializing in children with product, video graphic enhancements and high-tech entertainment. His written/photographic projects have appeared in major publications in England, France, Germany, Sweden and the U.S.